In the board game of Monsters Menace America you can do whatever you want. But you aren't the only giant monster around. While you are running around smashing and eating things, researching and mutating, planning nuclear strikes, other monsters are trying to do the same. It is a battle between you and all the other monsters. 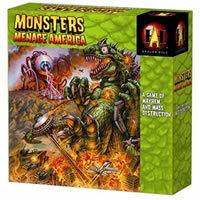 The Monsters Menace America board game is loaded with fun and also game pieces which gets all players involved. Make sure you have enough time to play this board game since it tends to take longer than most. Try to play Monsters Menace America today! You control one giant monster and one military branch. Strengthen your monster by mutating, increasing Health, and earning Infamy. Weaken the other monsters by attacking them with your military units and interfering with their vile plans. The game ends with the Monster Challenge, in which all the monsters battle to see who will become the King of the Giant Monsters and win the game. Monsters Menace America contains the game board, 6 giant monster pieces, 6 giant monster record tiles, 2 giant military units, 42 military units (8 for each branch), 3 dice, 2 giant military unit record tiles, 15 plastic sliders, 42 infamy tokens, 23 stomp markers, 5 military record tiles, 16 military research cards, 16 monster mutation cards, and the official Monsters Menace America rules and instructions. Please keep in mind that the official Monsters Menace board game rules and instructions could be different depending on the game version you have. The rules below are some of the exact directions on how to play Monsters Menace. Share with us your comments, funny stories, tips, advice, strategies, creative ways to play, questions about how to play, problems with the rules or anything you want about Monsters Menace. All submissions will be reviewed within 24 hours. Click here to add your Monsters Menace America comments.